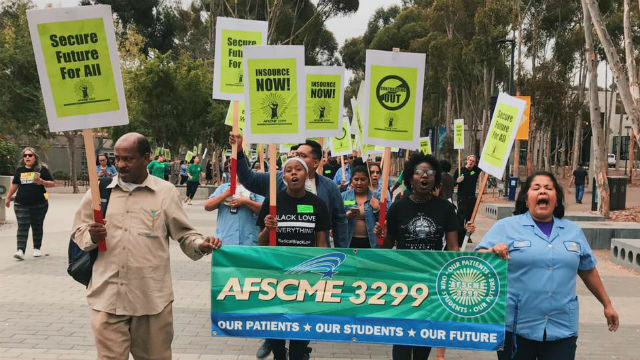 Thousands of University of California service workers are expected to begin a three-day strike Monday at campuses and medical facilities across the state, including at UC San Diego’s Jacobs Medical Center in La Jolla. In light of the impasse, the university system last month imposed contract terms on the union for the 2017-18 fiscal year, including 2 percent pay increases. The UC’s latest contract offer to the union included annual 3 percent raises over the next four years, according to the university. “Administrators are already showing us that we can expect more unequal treatment if we don’t stand up, fight back and hold UC accountable to its hollow claims of ‘pioneering a better future,”‘ Lybarger said.